Tiger is our classic uniform shoe made with full grain cowhide leather and a soft padded tongue for unparalleled comfort. It�s a traditional derby style shoe, so it has an understated look, but is designed with safety in mind. Upper: Water resistant and breathable. Waxy full grain leather. Reinforced stitching and bound bellows tongue edge for extra strength. Speed lacing system. Deep padded scoop collar. Lining: Padded, moisture wicking and highly breathable. Cool in summer, warm in winter. Footbed: VS100 twin shock absorbing footbed is contoured to supports and cradle the foot. Toecap: Wide fitting composite non sparking and thermal insulating. Tested to impact of 200 Joules. 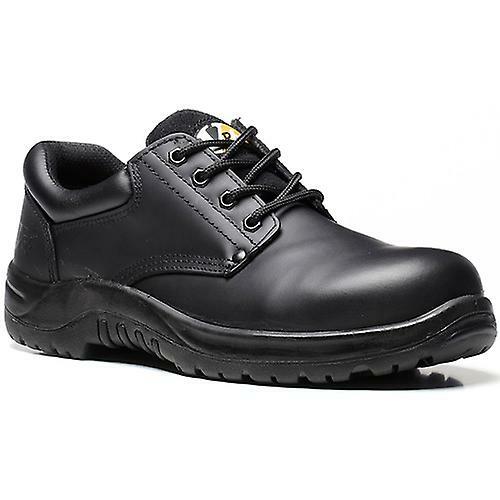 Protective midsole: Flexible corrosion resistant steel, pierce resistant to 1100N. Sole: 3D - a clever combination of 3 densities of polyurethane and Rubber. Ensures high slip, heat and abrasion resistance as well as comfort. Multi-directional tread ensures good traction in a variety of conditions. Heat resistant to approximately 300�C.